"Mom, what did you want to be when you grew up?" It's a natural question but one that can be hard to answer, especially when 1) you can't remember, or 2) you're still disappointed that you aren't what you wanted to become! When I was young, a lot of little 7 year old girls dreamed about being a princess or a ballerina or a fairy. I dreamed about being a mermaid. In the 1970s, my family took annual vacations to Florida. Back then, there was no Disney World or Harry Potter World, no Universal Studios or Wet'n'Wild. We visited the original attractions that featured tutu'd waterskiers and dolphin (porpoise) shows, glass bottomed boats and pressed wax souvenirs. It was all awesome, and I thank my parents for giving us such wonderful experiences. But there was one very special place my parents took me that changed my life forever. 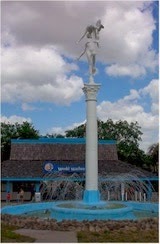 Weeki Wachee Springs: Home of the live mermaid show. Even though I couldn't swim a lick, couldn't hold my breath for more than 10 seconds and refused to put my face underwater, I wanted to be a mermaid. They moved like poetry. They were magical, like fairies under water. They were lyrical and beautiful and strong. They were the mythical made real. Although I have moved on - fear of water kept me from ever seriously thinking of strapping on a tail and jumping down into a long, inescapable tunnel - I still love my Weeki Wachee mermaids. About 13 years ago, on a trip to the Gulf Coast to visit friends, I told my husband, "We have to go to Weeki Wachee." "What the heck is a weekiwachee?" he asked. Stunned, I replied, "Only the home of the most amazing underwater show of all time - live mermaids! I haven't been since I was little but you have to take me." He rolled his eyes and speculated that the same women from the 1970s were probably still working there, but he steered the car down I-10/Hwy 301 until we found US-19 and the Weeki Wachee entrance I remembered from childhood. The park was looking a little peaked, more than a little worn around the edges. But the mermaids were still there. And to our pleasant surprise, there were mermaids of various ages, sizes and abilities. In addition to putting on several shows a day, the mermaids were working very hard to bring the park into the 21st century. They had added a rustic water park with slides and a swimming area, taking advantage of the cold, crystal-clear fresh water spring. They were sprucing up the costumes and the shows, training new mermaids from all over the world, and making necessary renovations. We gave them a donation, thanked them for the entertainment, and promised to spread the word. After that trip, my husband told everyone he knew about Weeki Wachee. I was thrilled that he enjoyed it so much, and that he was helping me spread the news. And it surprised me how few people had heard of Weeki Wachee. It's been around since the late 1940s, but since the advent of the Interstate system, few people travel down the back roads that run by the attraction. And the small, vintage amusement parks just don't have the marketing budgets to vie with the Disney Worlds and Universal Studios. But Weeki Wachee will always have a special place in my heart. We have taken several more trips to the west coast of Florida in the past ten years, and every time we make a beeline to my favorite spot. Our daughter has been several times, and last trip we even took one of her friends. It was an amazing treat for all of us. I hadn't thought about mermaids or Weeki Wachee in a while. Then yesterday, I learned something amazing. 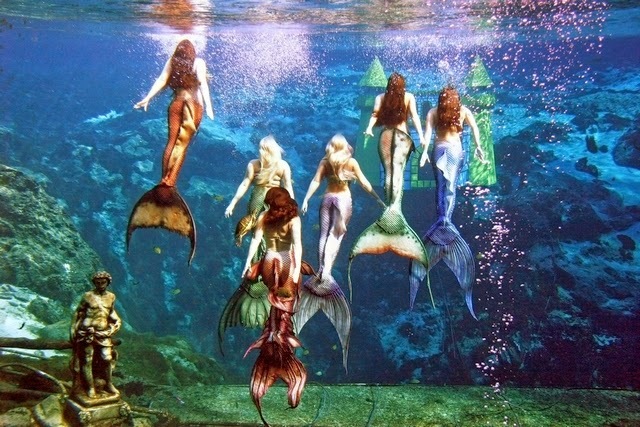 My Weeki Wachee mermaids are coming to the SC Aquarium in Charleston! In April 2014, the Great Tank will have not only sharks and sea turtles and amber jacks and volunteer divers, it will have real....live...Mermaids! It is such a brilliant publicity move, I wish I had thought of it myself. 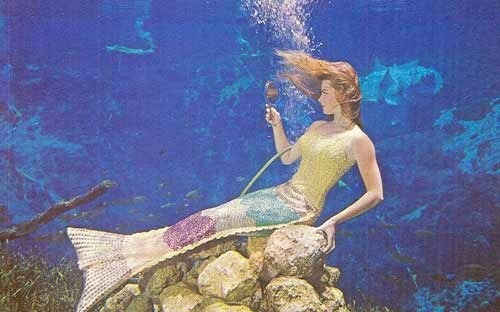 Gotta hand it to these savvy mermaids: Don't just sit on US-19 and wait for the people to come to Weeki Wachee - take Weeki Wachee to the people! While getting ready for bed last night, I turned to my husband, "Oh! Oh! Oh! Guess - just guess! - who is coming to the SC Aquarium?!?" A grin spread across his face. "Mermaids...mermaids are coming, that's who!" Some people might think it's a little silly for a 50 year old woman to be so ga-ga over mermaids, over trained swimmers wearing fake tails. Especially since, despite my childhood dream, I'll never be one. Truth is, I don't want to be a mermaid now. I'm not sure I ever really did. I think what I really wanted to be when I grew up was to be like a mermaid: Beautiful. Strong. Mystical. Unpredictable. Free. In my own way, I've achieved that. Not by donning a tail and performing underwater, but by creating my own fantastical stories, by becoming different characters on a stage, by tapping into the supernatural current that fuels my imagination. No matter how "grown up" I might be, I still grin at the thought of seeing my beloved mermaids swimming in the salty water of the South Carolina lowcountry. In my mind, I'll be swimming right beside them. Read more about the Weeki Wachee Mermaid visit to the SC Aquarium here and buy your tickets here. What a cool childhood memory! I've never heard of live mermaids, either. How neat that they're still around and you were able to share the experience with your family!